Established in ancient times, Devon is one of the oldest counties in England and has a long and colourful history. Human remains found in parts of the area have been dated to be over 30,000 years old, so there is no shortage of past residents of the county who might want to hang around for a little while after death. Because of this, Devon has earned a reputation as one of the most haunted spots in all of England. In fact, it is considered by many to be among the most active paranormal spots in the entire United Kingdom. This article is the latest in a series looking at some of the most haunted places in the UK. In it, we will be discussing five of Devon’s most creepy and fascinating locations. Here they are. 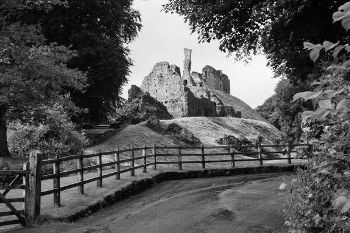 The first mention of Okehampton Castle in British history comes in the Domesday Book, which lists it as the home of a Baldwin De Brionne. From this, we can assume that the castle is almost 1000 years old. Though it today lies in ruins, the building has been the home of many other high profile members of British society, including the Marquess of Exeter, who was enjoying a wonderfully decadent life before being found guilty of conspiring against King Henry VIII and sentenced to death. 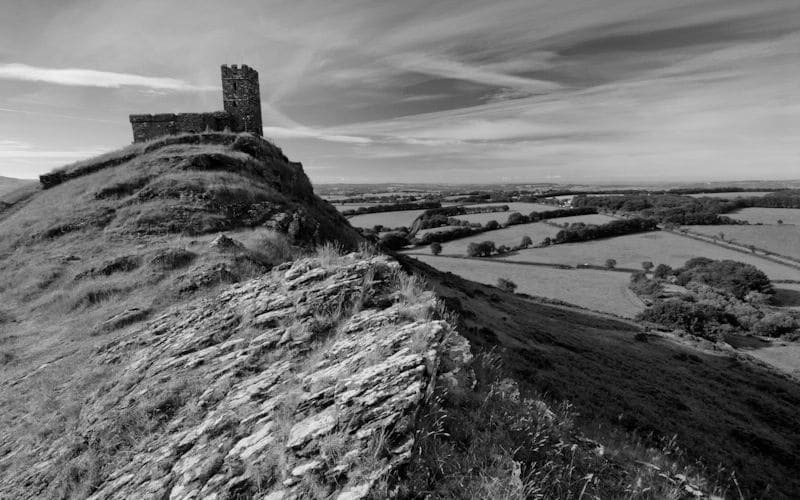 Though there stand no walls for a ghost to occupy, Okehampton Castle is said to be home to the spirit of a woman who found a great deal of joy in poisoning any man who was silly enough to take her for his wife. As punishment for her terrible deeds during her time among the living, the sinister widow is forced to make a nightly journey from Dartmoor to Okehampton Castle in order to pluck a single blade of grass before returning home. The story goes that only once the hillside is stripped bare will the woman’s penance be completed. While this is most certainly a horrible way to spend your afterlife, the murderous wife can take solace in the fact that she at least gets to ride in style. Those who have encountered the woman on one of her countless journeys report that she travels in a carriage composed of the bones of the men she murdered, driven by a headless chauffeur and guided by a demonic hound. 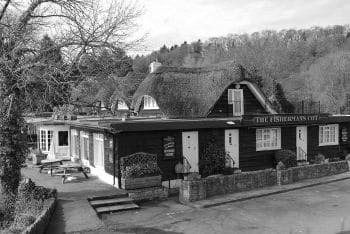 Despite the fact The Fisherman’s Cot in Bickleigh looks as old as some of the other haunted public houses throughout the United Kingdom, the building itself is actually less than 100 years old. It was built in 1933 as a private fishing lodge, so those looking for a glimpse into old England will have to look elsewhere. That is not to say that The Fisherman’s Cot is without its own unique history. In fact, the inn has welcomed quite a few notable guests over the decades, including Paul Simon, considered by many to be one of the finest lyricists of our time. It is said that Simon was inspired to write his hit “Bridge Over Troubled Water” after observing flooding of the area from his window. Of course, Paul Simon eventually elected to leave England and return to the United States to continue changing the course of popular music. Other visitors, however, have not been so eager to checkout. According to staff at the inn, the building is haunted by the spirit of a young lady whose identity remains a mystery. Thankfully, the spirit is not a menacing one and is in fact quite a bit more jovial than your usual ghoul. She is said to be most active around the bar area and the sound of her laughter is frequently heard by guests and bar staff alike. Though the woman behind the laughter has not revealed herself at any point over the years, guests at The Fisherman’s Cot have reported seeing another spirit just outside the inn. This ghost is quite a bit more disturbing than the playful young lady who spends her time drinking with the regulars – it is that of a headless horseman. The horseman is frequently seen riding across Bickleigh bridge, which may be a portal back to his own time. There are many who have not actually seen the headless horseman materialise, but have reported hearing the sounds of a horse thundering across the bridge. If you’re determined to spend the night in a haunted inn in Devon but aren’t quite taken by The Fisherman’s Cot, then you might want to give Churston Court Inn a try. This building is significantly older than the previous inn and dates all the way back to the 12th Century. The inn has seen many notable guests throughout the centuries, including novelist Agatha Christie. Christie was so fond of the site that she donated a stained glass window to the church next door. 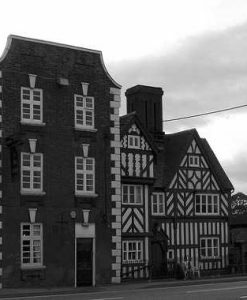 Even Bruce Reynolds, one of 15 perpetrators of the Great Train Robbery, chose the Churston Court Inn for his hideout in the wake of his crime. 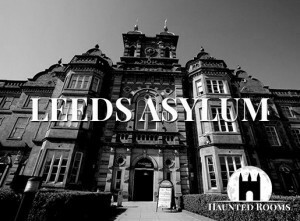 Today, the building is a Grade I listed building and boasts many of its original features, so both paranormal enthusiasts and history buffs have something to look forward to. 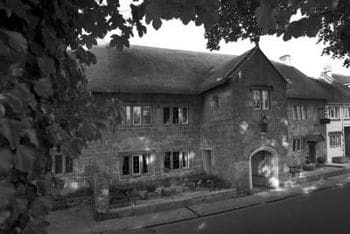 Churston Court Inn is home to a variety of ghosts and it is safe to say that any member of staff who has worked in the building for an extended period of time has their own ghost story to tell. The most frequently encountered spirits are those of monks, who seem to travel throughout the inn as if in a monastery, paying little attention to the modern world which surrounds them. For the most part, these monks appear together in a group, though it is not unusual to hear reports of a single phantom monk making an appearance in the kitchen area. Staff have also complained about lit candles being extinguished when there is not so much as a slight breeze in the room, only for the flame to suddenly spring back into life before being put out again. This process continues over and over again until whatever entity is meddling with the candles grows tired of it and moves on. 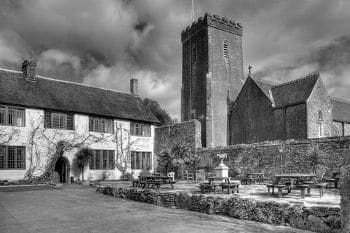 Because of the building’s reputation as a paranormal hotspot, the Torbay Investigators of the Paranormal have chosen Churston Court Inn as the venue for their meet-ups, which are held with a great deal of frequency, typically on a Monday night. Anybody seeking more information about the paranormal activity in the area should be sure to make contact with these guys as they are knowledgable, pleasant to deal it, and, of course, completely open minded when it comes to the paranormal. 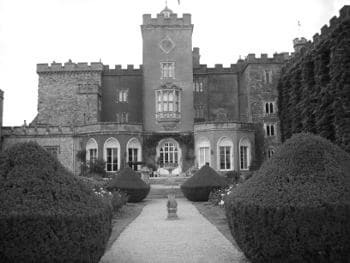 Powderham Castle is another Grade I listed building in Devon said to be haunted. The core of the current castle was built sometime between the 14th and 15th Centuries by Sir Phillip Courtenay. Renovations have been made a number of times throughout the castle’s history, with the building growing larger every time. The building is today owned by the 19th Earl of Devon, who inherited it after his father ran into a bit of a financial problem. In 2009, the elder Earl refused to rent out the castle to a gay couple who wanted it to be the scene of their civil partnership ceremony as he did not agree with their lifestyle. As a result of his bigotry, he saw his wedding licence revoked, which resulted in a great deal of lost revenue. However, old-fashioned homophobia is far from the scariest thing associated with Powderham Castle as the building is said to be inhabited by many creatures of the afterlife. One of the most feared ghosts at Powderham Castle is The Grey Lady, who is usually encountered floating around the massive library of the home. During her earthly life, she is believed to have been Lady Frances, the wife of Viscount Courtenay. The Grey Lady is not an aggressive ghost and does not appear with frequency. So why is she so terrifying? Well, it is said that a visit from the spirit of Lady Frances is a bad omen, and foreshadows the death of the head of the house. Perhaps the most tragic spirit at the castle is the ghost of a young mother who is frequently seen holding her infant child as she moves around the castle in a state of despondence. The sightings of the mother and child go back several hundred years, though at first nobody was able to figure out who the pair might have been. During some construction at the castle 200 years ago, builders broke down a wall and were horrified to discover the remains of a woman and infant. After putting two and two together, the owners of Powderham Castle arranged for a more dignified burial of the bodies. However, this did little to sooth the activity at the castle and the mother and child continue to appear at to this day. The Three Crowns Hotel is a Grade II listed building located in Chagford and owned by St. Austell Brewery. For the first few hundred years of its existence, the 13th Century building was a manor house and was at one point home to a Mary Whiddon, who is noteworthy mainly due to the fact that she was shot on the steps of the church as she arrived for her own wedding in 1641. A mere two years later Sidney Godolphin, a poet-turned-soldier, was wounded in battle and brought to the manor to recover. Unfortunately, such a recovery never took place and Godolphin died from his injuries. 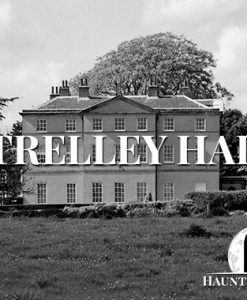 Almost immediately after Sidney Godolphin passed away, visitors to the manor began reporting strange events which could not be explained by anything in the known world. It finally became clear who was behind the mysterious goings-on when Godolphin’s ghost began appearing to people inside the manor, clad in the uniform he had been wearing at the time of his death. It surprised some that Godolphin, a gentle soul by nature, would be decked out in army gear in the afterlife, but perhaps the ghost figured that if he was going to die for his country, he would at least get some use out of the uniform he got for it. Sightings of Sindey Godolphin’s ghost continue to this day, and the many renovations which have been carried out at the property over the years seem to have only exasperated paranormal activity on the location. More guests than ever before are reporting witnessing the poet’s spirit wandering through halls and walking through walls.